On Friday 15 December, we celebrated our second Intercultural Day in Maryfield. Over twenty cultures were represented on the day and students had the opportunity to talk to their peers about their cultures and find out more. There were lots of different types of food, as well as music, dance and traditional dress. The day was organised by the Global Issues Group in the school and partly funded by Worldwise Global Schools. We really enjoyed the day and are ready looking forward to the event next year! This Sixth Years invited the First Years to a Christmas Carol Service and Celebration on 11 December. Following a long-standing Maryfield tradition, readings, carols and Christmas songs were presented by Sixth Year students. Santa Claus, accompanied by one of his helpers paid a visit at the end of the event and distributed sweets to a thrilled and excited audience. First, Second and Third Years took to the stage on Thursday 21 December to perform a variety of acts. This highly entertaining production was organised by the hard-working Prefects who had been rehearsing with their classes at lunchtime for the past number of weeks. Thank you to all involved for making this such a successful and fun event. The annual Mulled Wine and Mince Pie Evening for parents of First Year students took place on Wednesday 22nd November. The evening began with a concert which showcased the wonderful musical talent of Maryfield students from a variety of year groups. The school choir, vocal ensembles, instrumentalists and solo singers treated the audience to a varied and entertaining programme. The First Years of course stole the show with both choral and solo performances. The evening concluded with a reception hosted by the Parents’ Association. A very enjoyable evening was had by all. 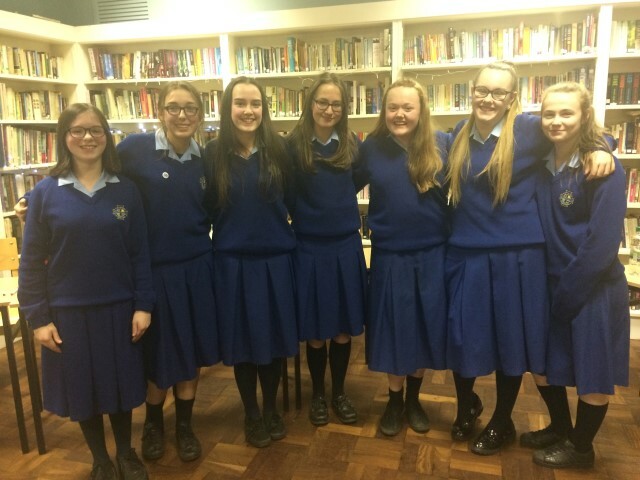 The Maryfield College Debate Team won their debate against St. Louis High School Rathmines on Tuesday 7th November. Both teams presented articulate and challenging arguments on the motion “To end world hunger, we must embrace GMOS” and there was lively debate and discussion. Congratulations to the team Ruth Connolly, Katie Farrell, Amy Moran and their captain Jennifer Keegan and thanks to all who came along to support. Maryfield students Jane Keyes (Senior Category) and Róisín Ferguson (Intermediate Category) achieved great success at the regional heats of The Poetry Aloud Competition which took place in The National Library of Ireland, Kildare Street Dublin on the 23rd of October. Both students were awarded places in the semi-finals on the 16th and 17th November. The prescribed poems in this year’s nationwide competition commemorate the 50th anniversary of the death of Patrick Kavanagh. Participants were required to recite two poems: one from the prescribed list and one of their own choosing from the prescribed anthologies. Eighteen Maryfield students entered this competition and all students were flawless in the articulation of their poems from memory. This was a great achievement for all who participated in this prestigious event. The ccommitment shown by all participants listed above, as well as the support of class audiences and staff, have all contributed to the success of this prestigious event. The Maryfield Parents’ Association in partnership with the school and the school Guidance Counsellor organised a very successful Careers Event on Tuesday the 7th of November. Professionals from a wide variety of career areas, attended. College advisors from DCU, DIT, NCI, Marino College and Portobello College, were also in attendance at this Expo type event which was held in the school gym. It was a wonderful opportunity for students from Third Year to Sixth Year to engage with experts from many fields of work and to consider possible career paths that they may follow in the future. Our students reported that they found the event very interesting and helpful while the guests complemented the students for their engaging and friendly manner. Thank you to all involved, the guests who volunteered to participate in the event and to our Parent’s Association. A showcase of the many clubs and activities that happen outside of class time took place in the school recently. This event was primarily aimed at our new First Years. Existing club members informed the students about the details of their activities and encouraged them to try out new things. These enthusiastic club members were very successful at recruitment.